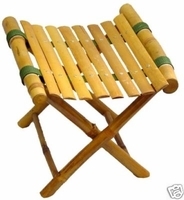 Foot stool is made from a eco friendly, high quality all natural bamboo. Stand has been fumigated and fully treated for maintaining its high quality, perfect for indoor and outdoor use. - Looks great with our bamboo recliner that is sold separately.